Jazz up your summer weeknight or weekend menus by serving this cool, refreshing salad as either a side or entree. 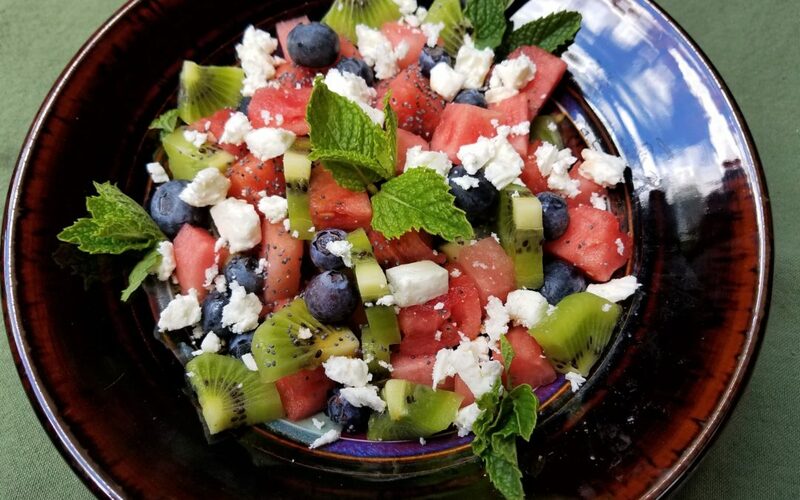 The sweetness of fresh, perfectly ripened watermelon combined with the tanginess of feta cheese creates a welcome flavor explosion that compliments picnic fare or serves as a satisfying stand-alone treat. Take it to the next level with the addition of grilled shrimp or chicken on a bed of fresh greens to create a fun and enticing entrée. The Berry Balsamic Poppy Seed Vinaigrette plays nicely with many fruits and leafy greens so is a great addition to your repertoire. Enjoy them all! Drizzle lightly with Berry Balsamic Poppy Seed Vinaigrette – approximately 1 – 1 ½ tablespoons per bowl. Top with a sprinkle of feta cheese. Garnish with chopped nuts and/or mint leaves, if desired. Serve immediately. Toss Butter, Bibb, or Leaf lettuce and a few thinly sliced onions with a small amount of the vinaigrette to lightly coat. Create a bed of dressed lettuce on a serving plate. Arrange watermelon and blueberries on top of the lettuce. Add grilled shrimp or sliced chicken breast on top of the fruit. Drizzle another small amount of the vinaigrette over the top. In a small bowl, whisk together the olive oil, vinegar, shallot, mustard and basil until emulsified. Add the poppy seeds, salt and pepper and whisk until combined. Refrigerated vinaigrette may become semi-solid. Bring to room temperature approximately 20 – 30 minutes prior to serving. Whisk together when ready to use.